The federal government has officially shut down on the one-year anniversary that Donald Trump was sworn in as president. Add Government Shutdown as an interest to stay up to date on the latest Government Shutdown news, video, and analysis from ABC News. Senators remained huddled on the chamber floor trying to broker a short-term plan to continue government funding into next week, but no deal appeared imminent. And, just minutes after the government shut down, the finger pointing began. The White House placed the blame squarely with Senate Democrats. Senate Majority Leader Mitch McConnell called the Democrats’ actions “cynical”. Senate Majority Leader Mitch McConnell speaks on the senate floor moments after government shutdown went into effect on Jan. 20, 2018. In a surprise move, McConnell said he will put up for a vote a short-term funding measure to keep the government running through Feb. 8, a compromise path that Sen. Lindsey Graham, R-South Carolina, had been pushing earlier in the evening. McConnell said the Senate will reconvene Saturday at noon. Over in the House, votes officially were ruled out for the night but leaders asked members to return later Saturday morning. Senate Minority Leader Chuck Schumer said he believed he was close to striking a deal at the White House today, after “reluctantly” offering to fund Trump’s border wall in exchange for protections for Deferred Action for Childhood Arrivals (DACA) program recipients. “President Trump, if you are listening, I am urging you: please take yes for an answer,” Schumer said. Schumer also repeatedly called the shutdown the “Trump shutdown”. The term began trending on social media. House Democratic Leader Nancy Pelosi said Trump deserved much of the blame. Senators negotiate after they failed to pass a deal to fund the government on Jan. 20, 2018. It was a night of frantic behind closed-doors negotiations as lawmakers held out hope for a bipartisan solution. 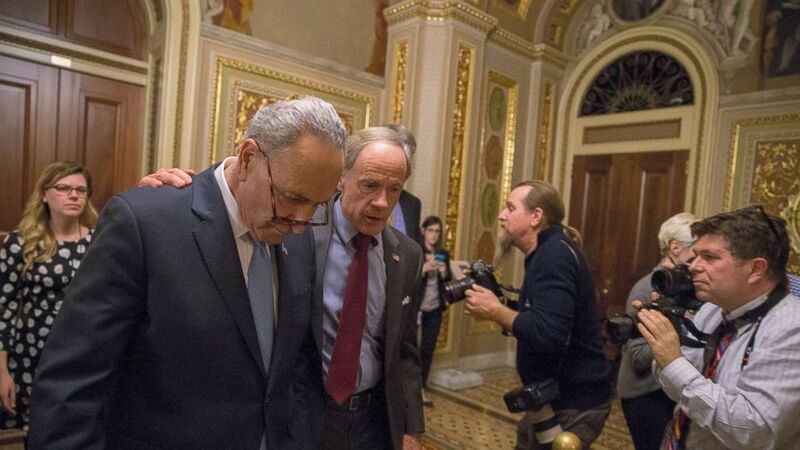 Late into the night, senators were still discussing a shorter plan to fund the government as the deadline drew ever closer — at one point, Schumer walked off the floor with McConnell, chatting on the sidelines — but no clear plan emerged. As the clock approached midnight, Graham huddled with GOP leaders before joining Sen. Jeff Flake, R-Arizona, in a discussion with Schumer, D-New York, and Senate Democrats. Senators continued to gather in tight groups on the Senate floor as Republican leaders held the vote open past midnight, locked in discussion as government funding lapsed. The vote was finally closed at 12:16 AM, with the continuing resolution failing to advance. Earlier in the evening, Sen. Graham floated the possibility of a three-week extension through Feb. 8. He was spotted shuffling between McConnell and Schumer’s offices acting as a go-between. The procedural vote that was held open could have happened hours earlier, but McConnell opted to force a late night vote, upping the pressure on Democrats. Democrats stood firm, opposing the bill over their demands that it include protections for Dreamers, who are poised to lose their legal protections come March 5. Senate Minority Leader Chuck Schumer speaks during a press conference to discuss their proposals for raising the 401(k) pre-tax contribution limits, Oct. 31, 2017 in Washington, D.C.
Five Democrats voted with Republicans to fund the government — four of them facing tough reelection battles in the coming months in states Trump handily won in the 2016 election. Those lawmakers include Sens. Claire McCaskill of Missouri, Joe Donnelly of Indiana, Joe Manchin of West Virginia and Heidi Heitkamp of North Dakota. Newly-elected Alabama Sen. Doug Jones also voted with that group, he is up for re-election in 2020. Four republicans voted down the measure, either because of their DACA concerns or military funding. Those senators include Graham of South Carolina, Flake of Arizona, Rand Paul of Kentucky and Mike Lee of Utah. Despite the apparent lack of a deal to avoid a shutdown, the mood was slightly more optimistic on both ends of Pennsylvania Avenue earlier on Friday evening with negotiators hopeful that a deal would come together — if not by midnight — then sometime this weekend before nearly a million federal workers head back to work on Monday. Missing Friday’s midnight deadline triggered a technical shutdown, but not one with significant immediate impact since most federal offices are closed over the weekend. “I think there’s a deal in the next 24 hours,” Mick Mulvaney, director of the Office of Management and Budget director, said on CNN earlier in the evening. “There’s a really good chance it gets fixed” before government offices open on Monday, he later told reporters in an impromptu off camera gaggle at the White House. President Trump, who cancelled a planned trip to Florida on Friday, engaged with lawmakers by phone and on Twitter. Not looking good for our great Military or Safety & Security on the very dangerous Southern Border. Dems want a Shutdown in order to help diminish the great success of the Tax Cuts, and what they are doing for our booming economy. Senate Majority Leader Mitch McConnell speaks as President Donald Trump, Vice President Mike Pence and Congressional Republicans gathered to celebrate passage of sweeping tax overhaul legislation on the South Lawn of the White House, Dec. 20, 2017. Earlier in the day, Mulvaney sent a memo to the heads of federal departments and agencies with guidance to review their contingency plans and be prepared to furlough non-essential employees. “This guidance reminds agencies of their responsibilities to plan for agency operations under such a contingency. At this time, agencies should be reviewing their plans for operations in the absence of appropriations,” Mulvaney said in the memo. The Office of Management and Budget has been working with agencies for the last week to make sure they prepared to enact their contingency plans if government funding lapsed, administration officials said. “You’re seeing across the board efforts by the administration and each of the agencies to minimize the impact of the shutdown on the American people,” one White House official said on a conference call with reporters. Senator Cory Booker (D-NJ) speaks at a rally outside the US Capital on January 19, 2018 in Washington, DC. A continuing resolution to fund the government has passed the House of Representatives but faces a stiff challenge in the Senate. Agencies have been encouraged to use “carryover balances” at their disposal to continue operations as normal for as long as possible. If lawmakers don’t show progress toward a resolution soon, some federal employees will begin to receive furlough notices as soon as Saturday, though administration officials could not offer an overall number. The military’s ongoing military operations will not be impacted, though nearly 1.3 million active duty service members would not be paid until after the shutdown ends. ABC News’ Becky Perlow and Jordyn Phelps contributed to this report.